Sugar Hit | Happy nom nom nom-ing! Nom your way through life. Feel the ocean breeze as you walk towards this restaurant. Or rather feel the freezing wind and it hits your face. Days in Sydney are nice and warm, but when it gets to night, it becomes so cold. 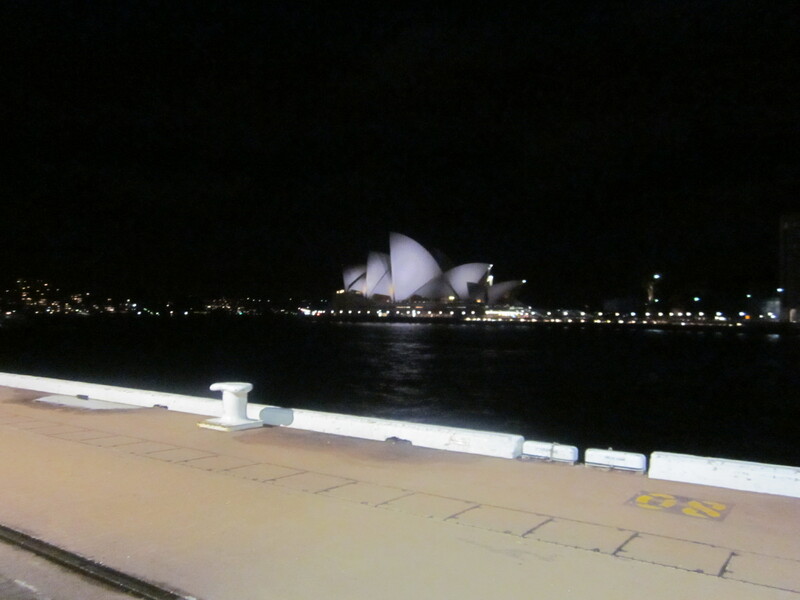 The boyfriend and I had been walking around the Opera House and Circular Quay before making our way to the restaurant. While the view is magnificent, it is being overshadowed by the fact that I am freezing and am making a beeline for the restaurant. Ocean Room sits at the lowest level of the Overseas Passenger Terminal and next to Wildfire. Ocean Room is directly across the water from the Sydney Opera House and the views at night are just breathless. The restaurant is easy to find and has entries on either ends of the restaurant to aid in easy access. The boyfriend and I were led through the restaurant from the entry facing the water to the other entrance where the bar area was. As I walked through the restaurant, I observed a group of Japanese businessmen playing drinking games, a group of Japanese businessmen talking about more serious issues and tables of couples. I love it when I see Japanese people in a Japanese restaurant, Chinese people in a Chinese restaurant, and so on. I truly believe that the restaurant is good as their own people eat there (does this make any sense?). It gives me a sense of relief that the restaurant’s target market isn’t just Caucasians and that they committed to the traditional with a twist of the modern. We are seated in the bar area where there are long benches and high stools. I’m not a fan of sitting on stool, I always manage to hurt myself and there’s nowhere to put my bag (I refuse to put my bag on the floor). However, the stools were quite comfy and there was enough room under the bench for me to hang onto my bag without ending up in an awkward position. But a disadvantage to sitting at a bench, you can’t really talk to the people at the other end. I prefer round tables where you can see and hear everyone else. We were also very close to the wine room where I could see shelves and shelves of wine stacked up on display. There was so much variety, enough to suit absolutely anyone. I’m not a big wine drinker but I was in awe when I saw the room. As the rest of the gang was late, the boyfriend and I chatted about the decor of the place. I love the interior design of the restaurant. The clever use of wooden tubes/pipes to create a wooden chandelier, designed by internationally acclaimed designer Yasumichi Morita. 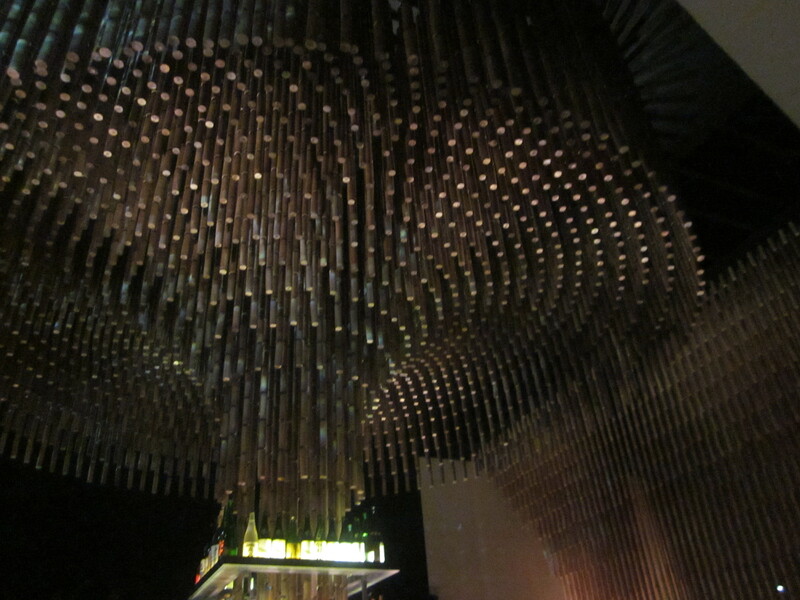 It was quite a large chandelier that spread throughout the restaurant. Not only does it represent modernity, but it is used as a divider between the dining area and the bar area. It was funny to see an exceptionally tall waiter having to bend down or dodge this low hanging ‘chandelier’ every time he walked past it, but he’s probably used to it now. It took half an hour, but finally everyone arrived and we ordered our drinks. It’s good to see that Ocean Room are willing to substitute a non-alcoholic drink for the Hennessy and Brown Brothers dessert wine that they had on offer. My friend jnyw from thefoodzoo opted for a hot chocolate. Unfortunately I didn’t get a photo of her hot chocolate (I didn’t want to steal it from her just to take a photo). But it did look very yummy. I chose the Brown Brother dessert wine. I didn’t really like this dessert wine. 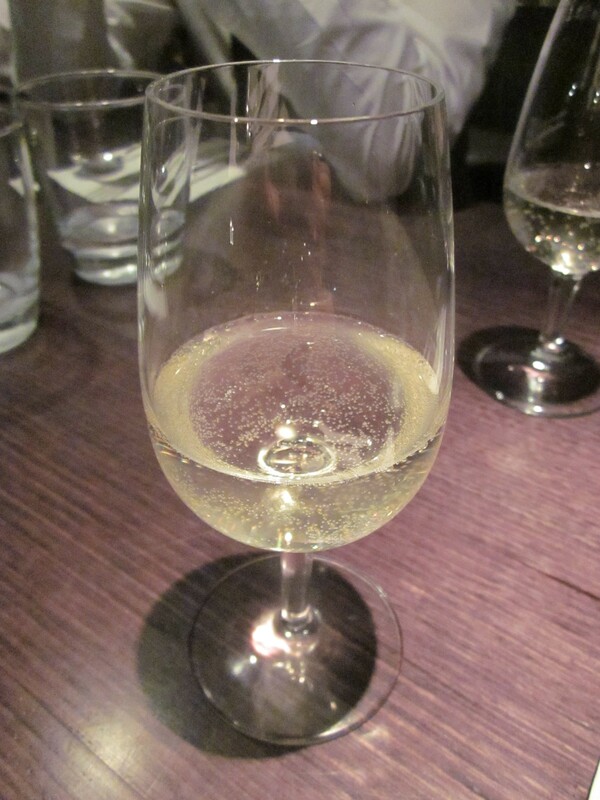 I suspect it was more of a sparkling white wine than a dessert wine. Do you see the bubbles? I though it tasted kind of plastic-y, but the boyfriend loved it. According to other blogs it was the same as the one served at Azuma, but I don’t think it was. My best friend went for the strong stuff and ordered the Hennessy VS. I’m not a fan of hard liquor. I find it too overpowering and I spend the rest of the time trying to find something to wash out the taste. The dessert was simple yet elegant, something that I would expect from somewhere like Ocean Room. The subtle flavours and textures worked together nicely to form this dish. I didn’t really enjoy the dessert wine but managed to drink it all as I thought it would start to grow on me, but it didn’t. The atmosphere was great. My friends and I saw there chatting after we had finished our desserts and there was no indication of the waiters trying to kick us out even though they were cleaning up the main dining area. I like how there was no pressure for us to leave, so we were able to soak up the environment even more. 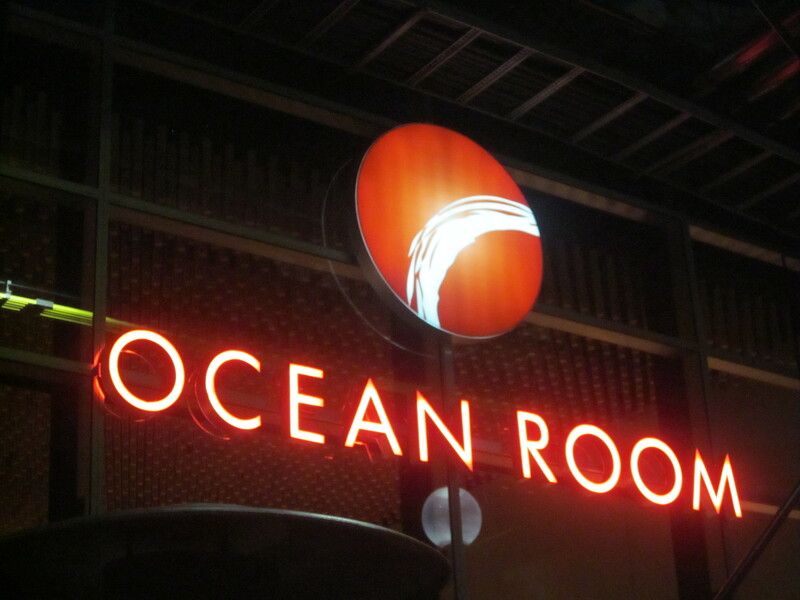 Ocean Room has great service and a great ambiance. It’s a Japanese restaurant with a modern twist to it that even the Japanese are willing to dine at. If they approve, so do I.
It’s not actually in the water, but that’s where Google Maps shows it. Before Sugar Hit, I had never heard of Bel Mondo. I decided to give this restaurant that I had never heard of a chance due to the fact that their Sugar Hit sounded delicious. I had been warned when making a booking that the restaurant was hard to find. They were NOT joking! The boyfriend and I parked relatively close and it still took a while for us to find the restaurant. After scrolling through Google Maps on my phone and then having to ask someone, we made our way up a flight of stairs into the darkness and found Bel Mondo tucked away an elevated part of The Rocks. My first impression of the restaurant, it seemed very exclusive. The everyday man/woman would not just stumble across this restaurant. It made the experience seem that much more special. The boyfriend pushed through some large doors (I had never had luck with large doors, I don’t have the strength) and we entered the bar area. There was a relaxed and inviting atmosphere. The bar area connected through to the dining area where I could see the somewhat romantic ambiance. It looked very warm. As we were having Sugar Hit, we were informed that it would be served in the bar area. We choose a nice comfy lounge against the wall where we could see the open kitchen. There were other patrons that looked excited to try out the Sugar Hit. We waited patiently (although I was very fidgety, I’ve never been very patient) for the waiter to come. He seemed very stressed and it looked like it had been a busy night. The bench was covered in bottles of empty wine and wine glasses. However, with the lighting, the array of glasses just looked like decorations. 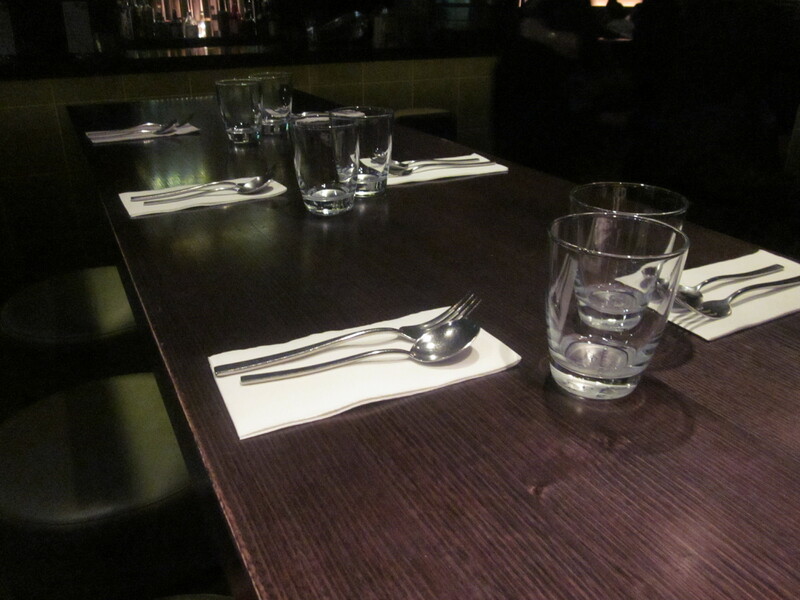 The waiter, Alex, finally set up our cutlery for our Sugar Hit and was very nice when I informed him I couldn’t drink. 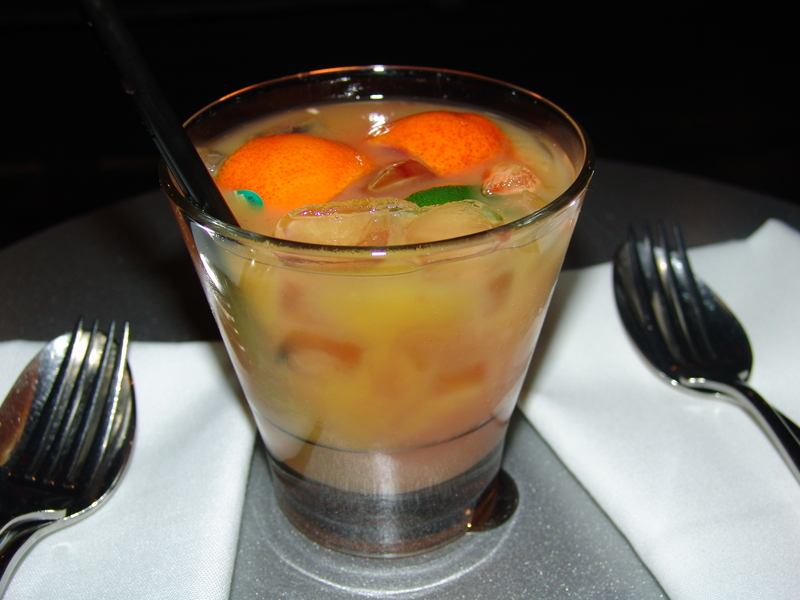 I ordered an orange juice instead and he offered to make it ‘special’ with a little twist. A little twist? I hope he didn’t mean vodka. Twice the amount of what the other customers received as the waiter put my share into the boyfriend’s glass as well. This was quite nice, one of my new favourite drinks. The splash of guava took away sourness from the orange juice and it made the drink really smooth. Downside to this drink I was given, there was still a fruit sticker on the blood orange. Do you see the fruit sticker I had to remove from the blood orange? The piece de resistance of Bel Mondo’s Sugar Hit. The dessert was lovely and was not overly sweet. Each element worked with each other to create a harmony of flavours. The french toast was nice and warm with a slightly crispy outer layer. It’s quite different to the french toast that I’m used to from Hong Kong style restaurants. 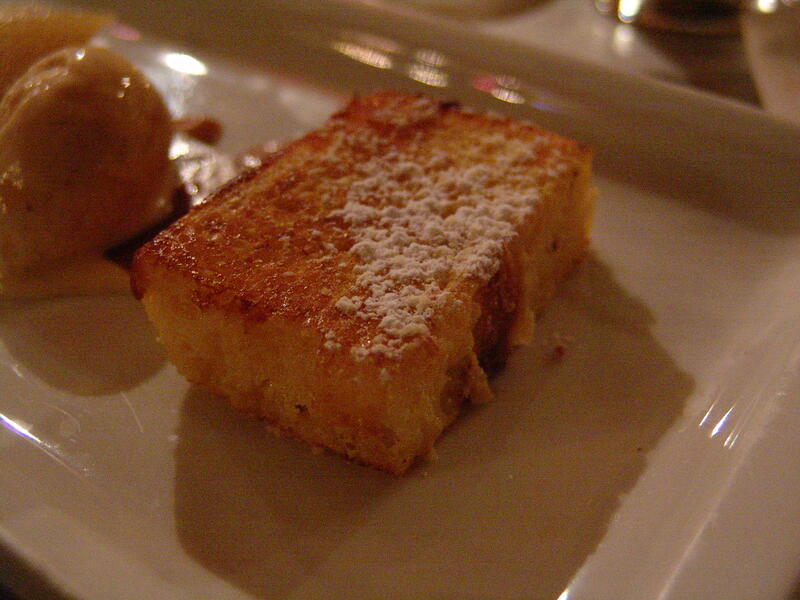 This french toast had notes of cinnamon which gave a warmth to the dish. The softness of the inside was quite pleasant to eat. The poached pear accentuated the natural sweetness of the fruit. The pear was soft but there was still a slight bite to it. Medjool dates are prized dates eaten in Middle Eastern cuisine. They are known to be extremely sweet which I thought overpowered this dish. The hazelnut praline ice cream was delightful. However, it was very soft and began to melt as soon as the dessert was put in front of me. The butterscotch sauce was rich and went well with the ice cream. When most elements of a dish are this good on their own, they become even better when eaten together. 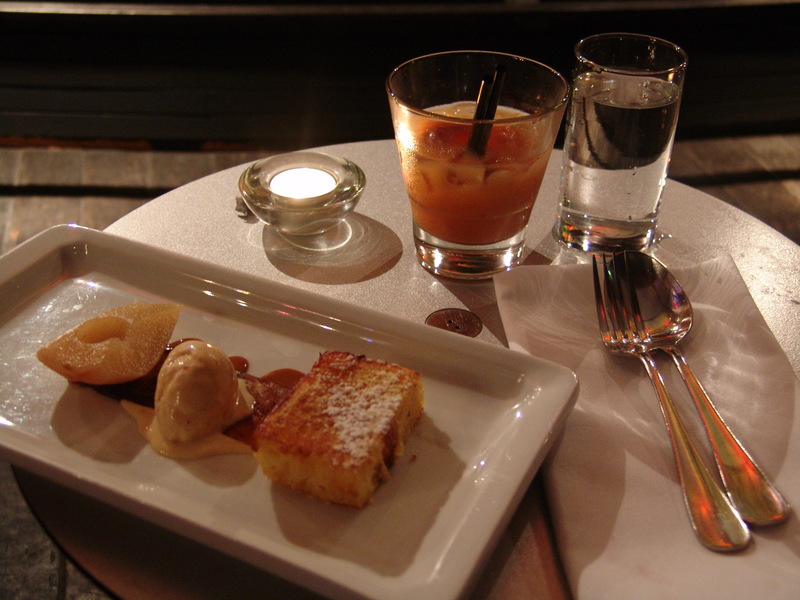 The warmth of the french toast melted the ice cream in my mouth, while the pears creates a burst of natural sweetness. The different textures in my mouth worked well together. The dessert was finished in no time at all. I hate it when something this good has to end. The only negative comment I shall give on this dessert is that I found the medjool dates overpowering and way too sweet. The boyfriend enjoyed it though, but he was not willing to finish my dates. Overall a very pleasant dish. The food, the ambiance and the service all receive top marks from me. This Sugar Hit was part of what I was trying to explain when describing the Sydney International Food Festival. I was able to visit a restaurant that I normally would not be able to see when I walk past The Rocks. I was introduced to a different restaurant where I’m eager to visit sometime in the future. I had originally not planned on going to the Grace Cafe for Sugar Hit as I had read reviews on last year’s Sugar Hit. 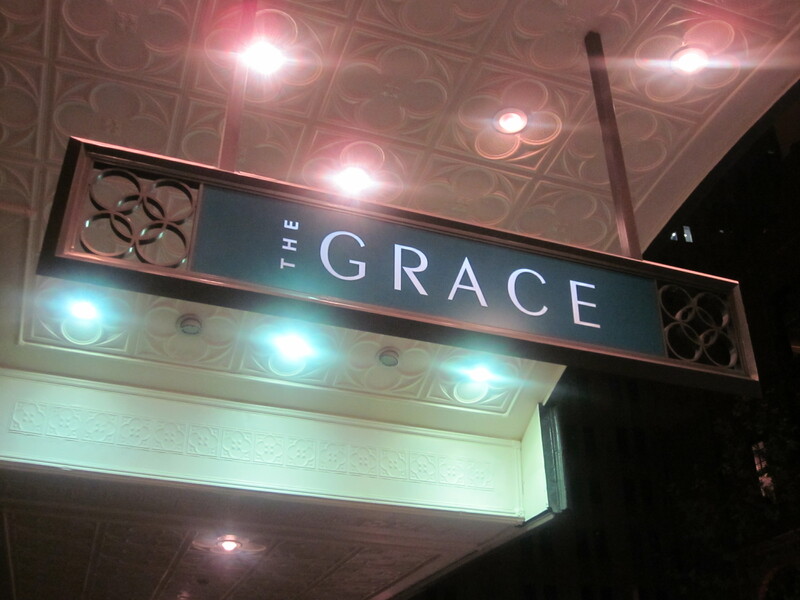 However, my best friend’s new girlfriend wanted to try it out, and how can I say no to dessert?I have driven past the Grace Hotel many times but have never set foot in it. I never even realised there was a restaurant there until the night I went for Sugar Hit. The main dining area of the cafe is a reasonable size from what I remember to be high ceilings. However, we were whisked away to an upstairs area. This area was more intimate and quite. The group at the bar next to us were quite well behaved, not the usual bunch you see on a Friday night. We were sat at some coffee tables and some lounges, comfortable for relaxing in, not the most comfortable to try and eat dessert in. But that had to do as I was excited to bite into my first Sugar Hit of the year. The manager came out and was excited to explain to us that we were the first to try out Grace Cafe’s Sugar Hit for 2010, that made me even more excited. I was like a giddy girl in a candy store. I like being the first to try something out, it kind of makes you feel exclusive and special. When our desserts came out, we were in awe. It was a mountain of deliciousness. Things piled up high seem more appealing than something lay flat on a plate. However, I soon found out the difficulty of eating a dessert piled up so high. 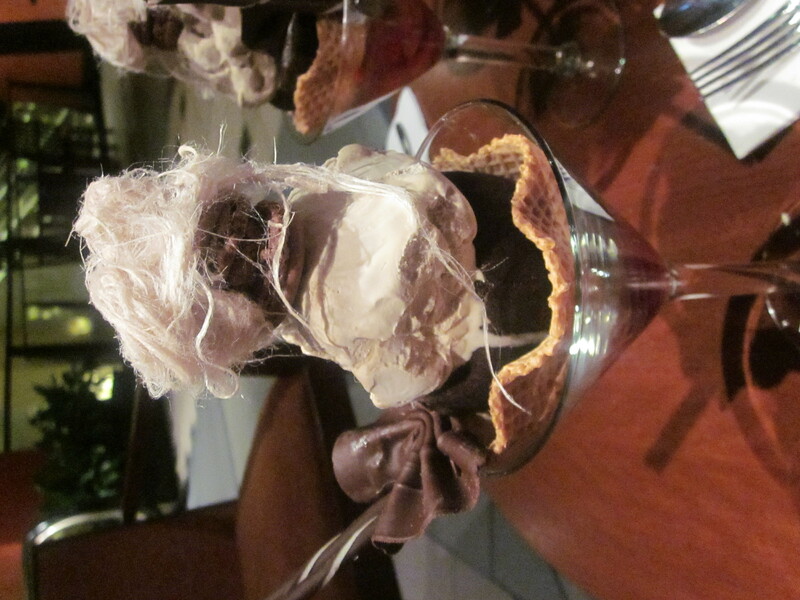 Chocolate fairy floss. I was transported back to when I was a kid and I would eat fairy floss at the Sydney Royal Easter Show. Actually, I still eat fairy floss now when I go to the Easter Show with my cousins 🙂 Back to the dessert.. There was a hint of chocolate in the fairy floss which made it even that more delicious. It creates a novelty for the consumer. Have dessert, have a little fun. Chocolate macaroon. I guess the hype about macaroons is still continuing on. Macaroons are always delicious when made right. And it being chocolate, how can it go wrong? Kahlua ice cream. I’m not a fan of ice cream or dairy. I like eating dairy products but it doesn’t agree with me. I had a couple of spoonfuls, but most of it was left untouched (this created problems for me later). Our scoop of ice cream was quite sizable and as I had left it mostly untouched, it began to melt and become a slight barrier to me reaching the lower levels. There was also nowhere for me to put it as the boyfriend, best friend and his girlfriend were not willing to take my scoop off my hands. Chocolate fondant with self-saucing chocolate centre. A fondant is absolutely mouth-wateringly delicious when made right, and this one was. The chocolate centre was warm and oozing out. It was like a party in my mouth. One of my favourite parts of the dessert. I have never met a person who doesn’t like chocolate fondant. It is just a crowd pleaser. People love watching the chocolate creep out when they break open the fondant. Absolutely delicious! Waffle basket. I’m not a fan of waffles either. I find them quite dry and they stick to my teeth which I hate. I had a little nibble, it was like what you would expect. However, it came into use when I needed to reach my last layer. It helped in enabling me to lift up any leftovers from previous layers to reach the next layer. Strawberries. These were well needed. The tartness and the slight sourness were needed to balance out the sweetness of the rest of the dish. I do wish there were more though and that they were not at the bottom of the glass. The dessert also came with 2 chocolate sticks and a chocolate bow just to add to the whole chocolate experience. The boyfriend offered to finish the chocolate sticks for me which I was happy to give him. 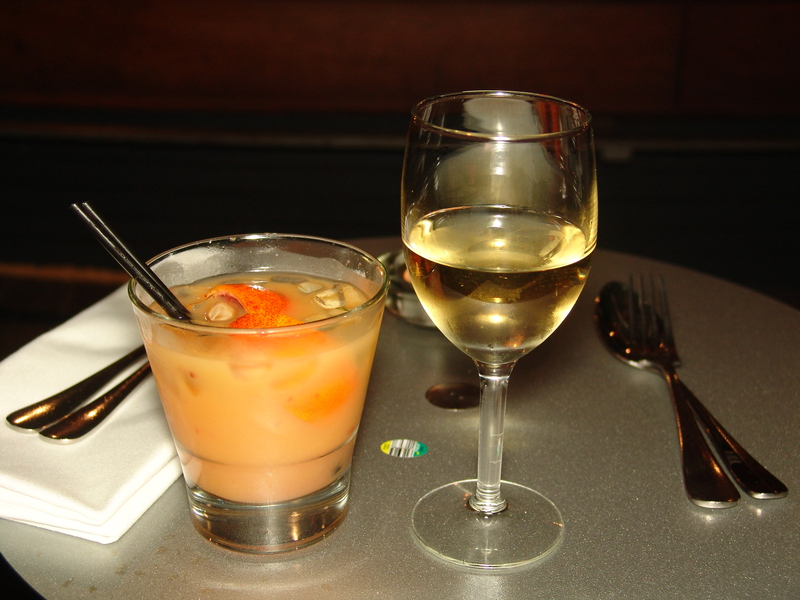 Each dessert came with a glass of Brown Brothers Orange Muscat dessert wine. It went well with the dessert. 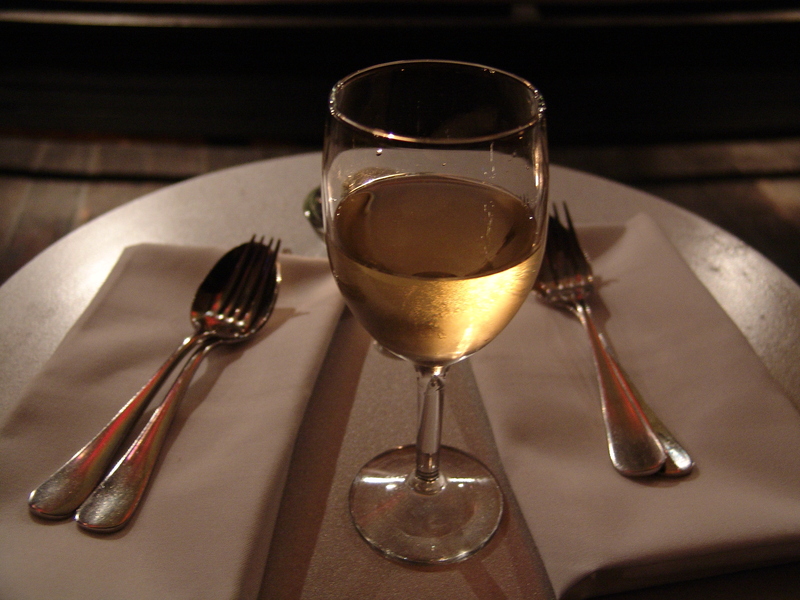 Usually dessert wines have a concentrated sweetness to it. However, I found this time that the dessert was even more indulgent than the wine and I found myself finishing the wine way before I had even finished the dessert. My suggestion is to order one between two to share as the whole dessert overall was quite rich and indulgent. You feel like you’ve eaten so much sugar that you won’t be able to sleep that night. It gave us all enough hype and energy to walk all the way to the night markets in Chinatown and then to Central station. Most of this spent skipping and being very happy. So if you love chocolate, this dessert is a must to try. One of my favourite things about October (apart from my parent’s birthdays) is that it’s a month devoted to the wide variety of great food we have in Sydney. One of my favourite events that happens during the Sydney International Food Festival are the wonderful array of Sugar Hits on offer. These are essentially desserts created by many chefs around Sydney to showcase their skills and I believe to also introduce people to many restaurants without having the pressure of having to sit down and spend hours on dinner. It gives people to opportunity to pay $20 for a set dessert accompanied by a glass of your choice of Brown Brothers dessert wine, Hennessy Cognac, or some restaurants may offer non-alcoholic drinks to cater for those P-plate drivers (me!). You get to experience the ambiance and the service of the restaurant and in a way lures you into wanting to try out the restaurant sometime in the future. Let me take you on a high through all the sugar and dessert wine I’ve consumed over the last couple of weeks. I’m sorry I’ve been gone for so long. I’ve had exams and I had to study hard for them. But now I’m free so I should have more time to update more often. Just a reminder that it is Sydney International Food Festival this month. I have been attending some fabulous Sugar Hits and have booked myself into some demonstrations and courses that are happening this month. I hope that Sydneysiders are able to take this opportunity to experience different foods, as well as different cultures. I love how Sydney is so multicultural. You meet so many different people from so many different walks of life. It gives you an opportunity to expand your mind and to see the world from a different light. I hope everyone has the chance to take part in some events. Sydneysiders, being to unbuckle your pants!